Pop quiz! What is a “pulse,” in food terms? Pulses are the edible seeds of legumes, including lentils, chickpeas, dry peas and beans. I’ve been a big fan of pulses ever since I stopped eating meat. All of a sudden, I was craving them and cooking them all the time. I shouldn’t have been surprised. Pulses are packed with protein, fiber and iron. Did you know that one half-cup serving of cooked lentils has twice as many antioxidants as blueberries and twice as much protein as quinoa? Plus, they’re inexpensive and an important drought-resistant crop to many people around the globe. They’re definitely a crave-worthy food, whether you’re a meat eater or not. I’m writing about pulses today because each year, the United Nations picks a topic of global interest. They named 2016 to be International Year of Pulses because of their significant health, economic and environmental benefits. Gearing up for 2016, the UN asked each country to submit one pulse recipe to represent their country. The USA Dry Pea and Lentil Council reached out to me to develop a recipe to be in the running. How cool is that?! We’ll talk about these tacos when you get back. They’re a little out there, I know. I discovered that golden, roasted cauliflower makes a great taco filling when I was in Austin. It’s a little crispy, a little chewy and totally perfect. I cooked up some lentils that are seasoned with onions, garlic, tomato paste, cumin and chili powder. Top all that off with a drizzle of spicy, creamy chipotle sauce and some fresh cilantro, and you have one tasty taco. Not to mention, affordable and good for you, too! Please let me know how these lentil tacos turn out for you in the comments! Looking for more fun taco recipes? I’ve got you covered right here. 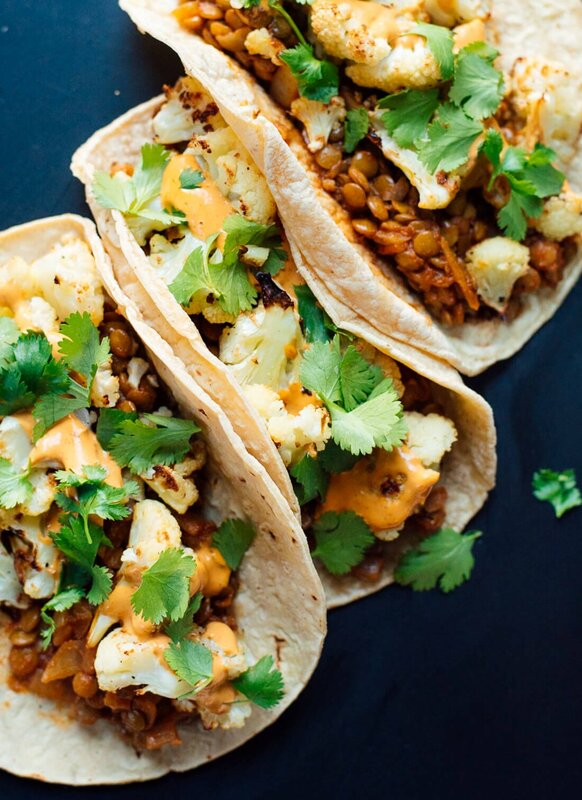 You’re going to love this vegetarian lentil tacos recipe. 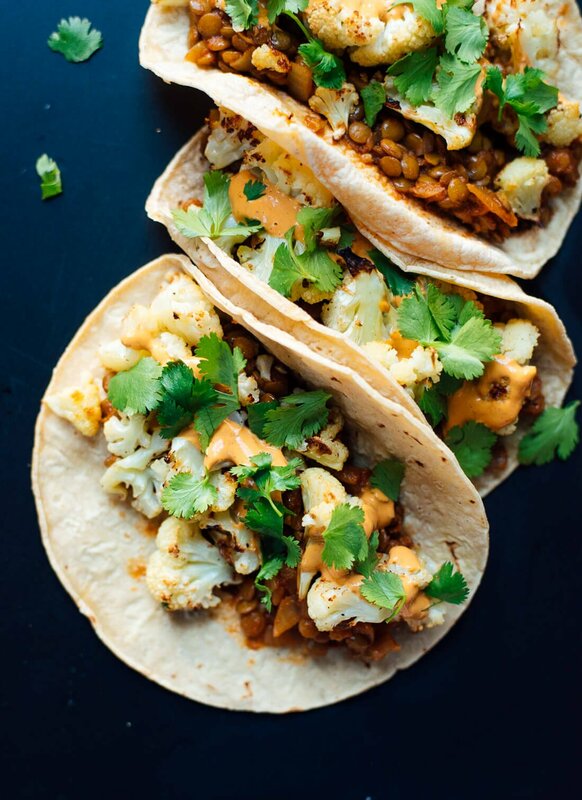 Roasted cauliflower, seasoned lentils and creamy chipotle sauce combine to make a delicious taco! Recipe yields 8 modestly portioned tacos. Make it gluten free: Be sure to use 100% corn, certified gluten-free tortillas. Chipotle sauce tip: If you have leftover sauce and peppers, pour the leftovers into a small freezer bag, then squeeze the air out of the bag and flatten out the bag. Store it in the freezer, flat, and you can just pull off as much as you need and defrost it! 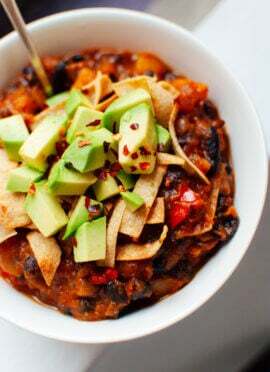 If you love this recipe: Check out my other taco recipes and lentil recipes! This recipe was created for USDAPLC as part of their National Signature Recipe Contest and I was compensated for my participation. Opinions are my own, always. Thank you for supporting the sponsors who support C+K! Wow, this was incredible. My kids gobbled up two tacos each! 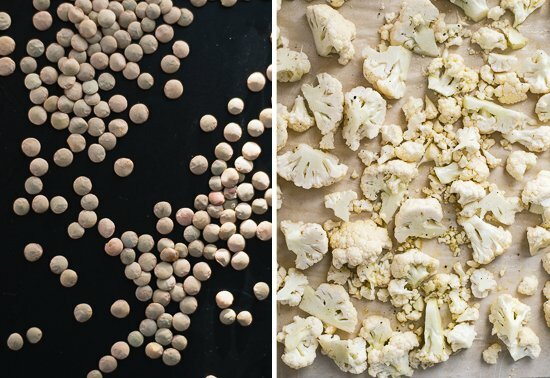 My 7 year old wasn’t a fan of the cauliflower, but couldn’t stop talking about how delicious the lentils were. My 3 year old at all of it! The chipotle sauce was so yummy, my husband saved some lentils & sauce for work tomorrow. I will definitely be making these all the time. Thank you! Hooray! Hit with the kids, that’s wonderful. Thanks for sharing! Yes, the sauce could be a little much for a little one. You can always scale back the spice. Delicious! Served with pan fried baby bellas too. So good. Whoa! These are AMAZING! 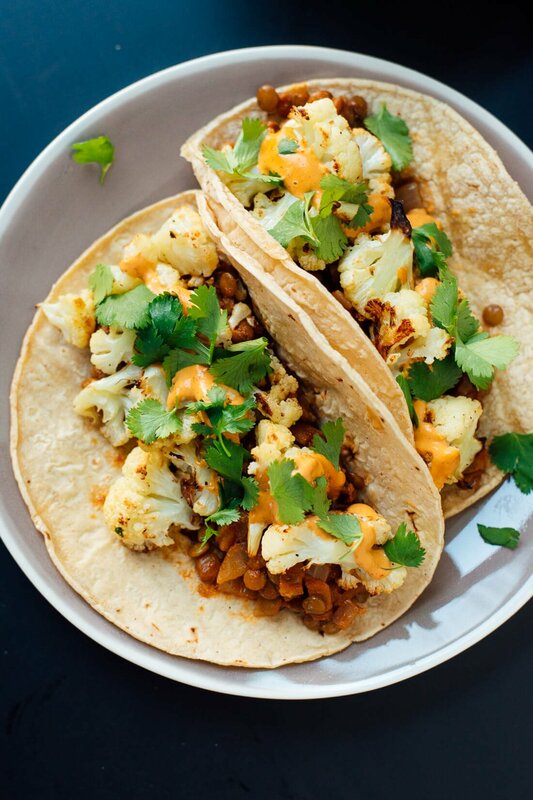 I probably never would’ve thought to pair lentils & cauliflower in a taco but this flavor profile is delicious! And the chipotle cream took it over the top! Thanks Kate! Right! Such a great combination. Thanks for the review, Colleen. Is there another sauce that would make these equally amazing? I can’t eat spicy foods, so chipotle is out – I also don’t use smoked paprika. Hmm… The chipotle sauce really helps make these so delicious. You could just use salsa and avocado. Or my avocado sauce for more creamy texture. Let me know what you think! I like the cabbage add! Thanks for sharing, Lisa. Hooray! Great to hear, Gail. Do you by chance have a macro breakdown for this recipe? 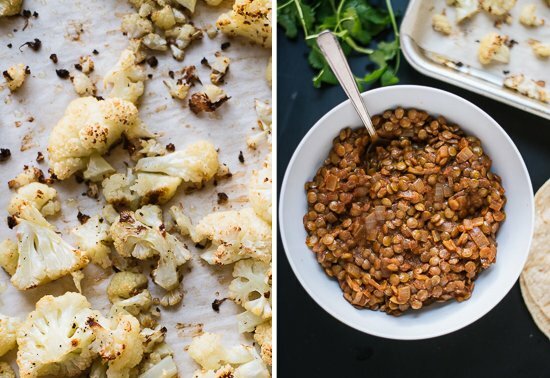 Was just told about this recipe today and can’t wait to try.. lentil suggestion? The only nutritional information I have is below the notes section. I’ve made this probably 4 times over the last two weeks because it’s THAT GOOD. The only thing I did differently was make the lentils in the instant pot. Love that, Sarah! Thanks for the review. I love this recipe. I keep going back to it. This is a staple dish in my house. Sometimes, I add a bit of sausage to lentils to mimic some of the ground meat taste and if a califlower head is too small, I had roast a can of garbanzo beans along with it to stretch out the dish. Finger licking good! I’m so happy you liked it, Jessica! I cooked this for my boyfriend and I last night and we loved it! 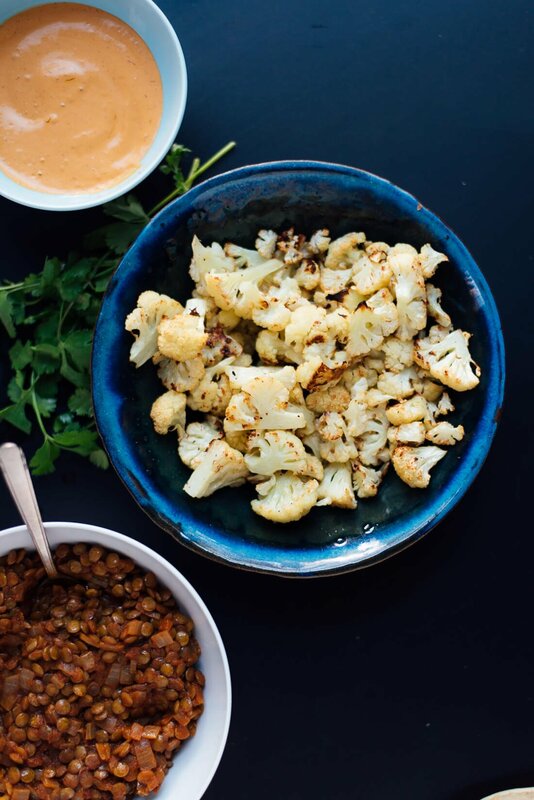 Great texture from the cauliflower and the lentils are super flavorful–we didn’t miss meat at all! Really yummy with that buttery sweet cauliflower flavor. Thank you for your review, Andrea! These were lovely and I really enjoyed the chipotle mayo!! 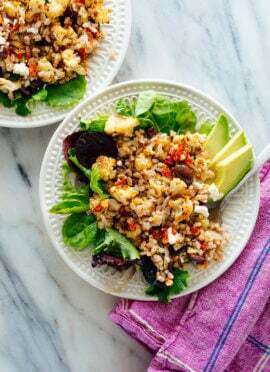 I’m going to make this again and add some beans and rice and make taco rice bowls! How long do you think the chipotle mayo lasts in the fridge? That sounds delicious! It should keep well covered in the fridge for a few days. This is now a regular meal at our house. I even served it at a dinner partywhen we had vegetarian guests. So good! I just found the “skip to recipe” button. I love it, because as much as I find your writing charming, I don’t need to read or scroll through t everytime. brilliant! I have it pinned so you keep getting hits. Nice work. This was really delicious! 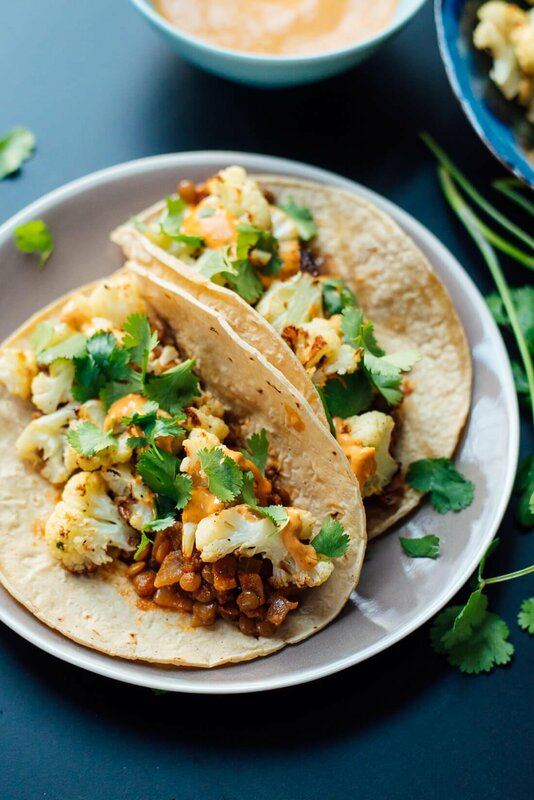 I would never have thought to use roasted cauliflower in a taco, but it was great! I substituted black lentils which I had on hand. Will definitely make this again! I may have commented on these before, (and I’m sure my review was a rave) but the adobo sauce is worth the price of admission! I have since used this sauce for every taco night. It’s a big hit. Tonight I made it with plain 0% fat yogurt and it was just as delicious. So if anyone is hesitant bc they don’t like mayonnaise, give plain yogurt a try. Thanks for sharing what you like to use, Beth! I made this for my non-vegetarian 80 year old Mother. My daughter and I loved it, but Mom said she loved it so much she “would eat this everyday if possible”! The flavors were great! The only problem, was they were gone so fast we didn’t get to take a picture to post. I have already bought the ingredients to double the recipe for next family gathering!!! Thank you so much! I love that! Thank you, Tracy.